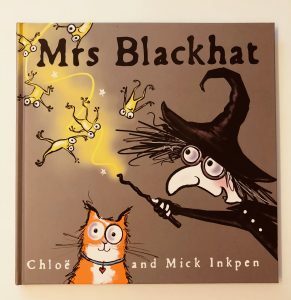 Our favourite book this Halloween has been Mrs Blackhat by Chloe & Mick Inkpen. Ivy LOVES it and I’ve easily read it 2-3 times a day in the last week! Mrs Blackhat is a witch whose life definitely has a colour scheme. Everything is black – her clothes, her broom, her cauldron, her house – except for one thing. She has a ginger cat! She finds this splash of colour extremely irksome so she sets out to find a way to transform her cat so that he’s more in keeping with her witchy style. Being somewhat of an online shopping addict she hops on her laptop and orders some potions and spells from her favourite site. However when they arrive they don’t quite perform as they should. Eventually she gives up and cancels her membership to the shopping site. A week later they send her a free gift to try and tempt her back – and the results are not quite what she expects! This book is great to read aloud as it features lots of quirky spells and fun sound effects. Ivy is a big fan of the extremely loud KABOOOOM in the final spell and the outcome always makes her laugh. Mrs Blackhat is very much the cliche of a cartoon witch and I love the way the writing gently pokes fun at her for this. Ultimately she learns that life is much more interesting when you live it in full colour and allow people to be themselves, rather than who you think they should be. It also gives a subtle nod to the dangers of online shopping, showing you that sometimes what you order isn’t necessarily what you receive!